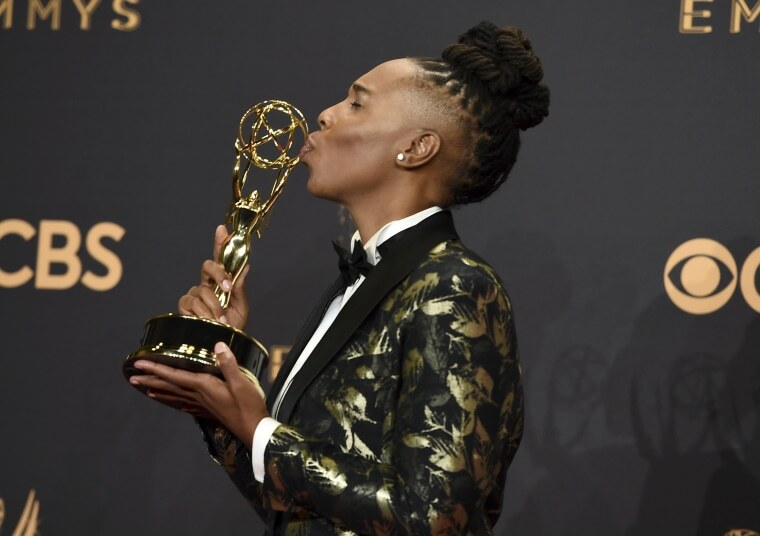 LOS ANGELES — It was a night of firsts for black comedians at the Emmys on Sunday. Lena Waithe made history as the first African-American woman to win for comedy writing, while Donald Glover became the first to win for comedy series directing. Waithe won for co-writing the "Thanksgiving" episode of "Master of None" with series co-creator and star, Aziz Ansari. Waithe has also had a recurring role on the Netflix comedy. The episode was based on her experience of coming out as a lesbian. Waithe called out the importance of diversity in entertainment and the culture at large in accepting the award. She was clearly overcome with emotion. "The things that make us different — those are our superpowers," she said. Waithe made special mention of her "LGBTQIA family" and urged viewers who feel outside of the mainstream to don a superhero cape every day "and go out there and conquer the world. It would not be as beautiful as it is if we weren't in it." Waithe is in the midst of a big career move. She's about to launch an autobiographical Showtime series, "The Chi," about her coming of age years in Chicago. She's also developing other TV projects. Glover not only made history for winning in comedy series directing for the "B.A.N." episode of "Atlanta," he also walked away with the comedy lead actor trophy for his role on the show. In the process of making his speech Sunday night, Glover jokingly give a shoutout to President Donald Trump — for an unconventional reason. "I want to thank Trump for making black people number one on the most-oppressed list," he said. "He's probably the reason I'm up here." Backstage, Glover said he was humbled by the recognition for his work and the breakthroughs that his wins represent. "It feels like a dream," Glover said. "I don't want to make the best indie movie; I want to make the best movie. I don't believe in labels like that. I'm glad I made history, but that's not what I'm trying to do. I believe people deserve quality." Glover has had quite a rise since he began his TV career by landing a job as a writer on "30 Rock" in 2006 when he was fresh out of NYU. From there, he moved on to a writing and co-starring gig on the cult favorite comedy "Community."